Only there’s more to Aidan than meets the eye--much, much more. And once she learns the horrible truth, there’s no turning back from her destiny. Their destiny. Together, Violet and Aidan must face a common enemy--if only they can do so without destroying each other first. Haven was a book that I was much anticipating. Once I received it, I cracked it open and devoured it! The book packs a lot of punch but it is not overwhelming at all, it is actually very well balanced. There is a lot of story to tell in this book. Violet's story, Winterhaven's story, Aidan's story. And all the background information between the students and teachers of Winterhaven. There was a great balance between the main story and the back stories. I've read a few books in the past that tried to pack a lot into the book but it just ended up messy and confusing, Kristi Cook pulled it off very well! Haven is very magical. It wisps you away from the hustle and bustle of ordinary life and transports you into this whimsical place. Not all of it is lollipops and rainbows though, there is a great deal of suspense. Violet finds herself running into a few obstacles herself. Although the first 100 pages or so focus's mostly on character development, it never slacks. The author did a great job at keeping my attention, once you reach the climatic scenes you'll be zooming through the pages. Be sure to have a good gap of time free when picking up this book, because you'll find it very difficult to put it down. The character cast is phenomenal. I instantly bonded with Violet and Ce-Ce. Violet was just like any average teenager but I found her mature beyond her years. There were times when she would whine or sulk(but what teenager doesn't do that). She is a very lovable character. Although Ce-Ce was a secondary character, she reminded me a lot of my close friends. She had a small circle of friends but she was loyal to each one of them. She is a very caring and considerate character. In Haven there is something for everyone: Suspense, light humour, action and romance, all wrapped up in a wicked paranormal package. 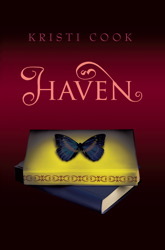 2011 has kicked off with some fantastic books, and Haven is one of them! A fantastic debut novel for Kristen Cook. What I loved: The beautiful flow of the storyline. The wonderful characters, and the fact that it was my little "getaway" from my busy days. I look forward to reading it. What I disliked: The cover is stunning, but I am a little confused about the butterfly. I'm not sure what it signified. oooo i just added this to my wishlist!! I've heard really good things about this book. I love novels that have boarding schools in them for some reason. I think I must have secretly desired to go to one in another life or something. Stopping by to tell you about a book giveaway. I was so forunate as to read it already. I LOVED it! I love the kids with ESP and the even stranger kids hiding among them. this book was the best ever, omg i could not put it down. i read it in a day. kristi cook should make a sequal . i would read it over and over it was 'da best !!!!!!!!!!!!!!!!!!!!!!!!!!!!!!!!!!!! Grab your pooch and let's chat! In My Mailbox...My first Vlog! 500+ Followers! You guys rock!